“Musashi looks at the peony”: a painting from 2011. 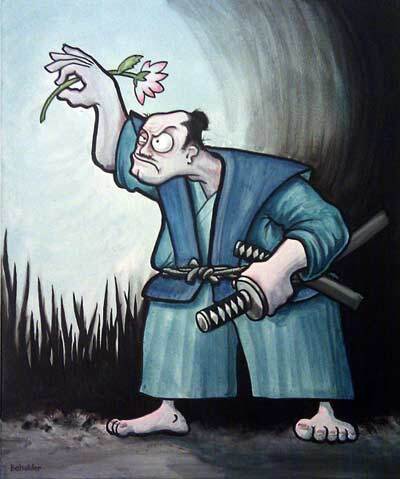 From the Fudebakublog: “It’s a rendition of Miyamoto Musashi scowling at a flower, and it was done as a token of support for the opening of the new Heijoshin dojo in Brownhills, UK, in 2011. If all went to plan, the painting should be hanging up in the toilet there now. My affection for Heijoshin (who practise the esoteric art of iaido, as well as kenjutsu and jodo) goes back to the maelstrom of cultural absurdity that was Seni 2003, where the Fudebakudo book launched, and where I first met Scott and some of his students.” The story depicted in the painting is also described on the blog. I almost never work with paints, and I’m not really happy with how this turned out (really I should have spent an extra day on a Japanese castle gate as a decent background), but — as Musashi would probably point out — that’s what you get for not applying yourself, or practising. Low-res photo (sorry) of acrylic on canvas (about 50cm x 60cm).